The program was held April 26-27 2018 at William B. Travis Early College High School in Austin, TX. This Peace through PIE PIElot Circle is the brainchild of Travis Principle, Ty Davidson, and was developed between Peace through PIE., and Assistant Principal, David S. Crissey. 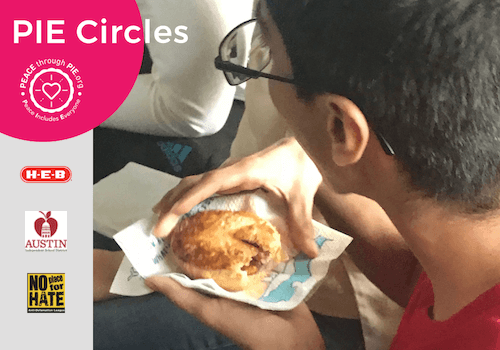 Students discussed how peace-centered values and food (Peace Pie) serve as strong mediators and connectors that defuse conflict in their lives. Students learn to handle personal and social issues that defuse confrontation, anxiety, and bullying. These two twenty-minute sessions were held two consecutive days and supported 170 Social Emotional Learning (SEL) Circles, 1,400 students. With the help of Chef Adam Phillips (head of the Travis Culinary department), students became professional caterers and learned how to develop, bake and package 1,400 hand-held Peace Pies that were distributed to each student in the circles. The materials for this program was made possible through a direct HEB donation that was secured through Peace through PIE's Peace Partner Catalyst Program.